For the man who found a second can of paint and finally tackled our rusty old shed! We rarely use disposable, but my mom brought a jumbo pack of paper plates to help us through the month (no dishwasher!). I do think they look much nicer in wicker plate holders. That way you can use the cheapest paper plates available without worrying about buckling. They're also great for delivering pies in aluminum pie plates. The holders only cost 25 cents apiece new--but I find them all the time for five or ten cents at yard sales. I know the post was on wicker plate holders but I keep wanting that tray of yours. Yard sale find, I suppose. Thank you! I even HAVE those holders ... (bought them for a Scout troop activity) ... I've got a family of 6 coming to visit for a few days at the end of the month. All I need now is some El Cheapo paper plates. That's so great! I love the wicker plate holders - what a good idea. 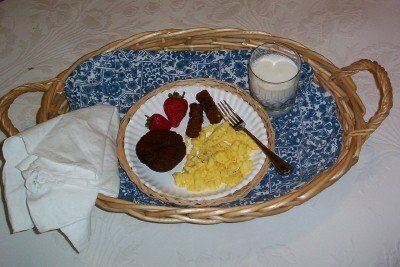 Maybe I'll surprise my husband by bringing him breakfast in bed this weekend!